AF-5000 series displays need access to current valid data files to utilize all of its functionality. So, what files do you need? *Files are loaded by accessing the [SET] > Hold [CAL] > Admin Settings > Transfer Files page within the display. ➤ New USB memory stick? Click for setup instructions. Only ONE USB memory stick per EFIS may be used at a time. 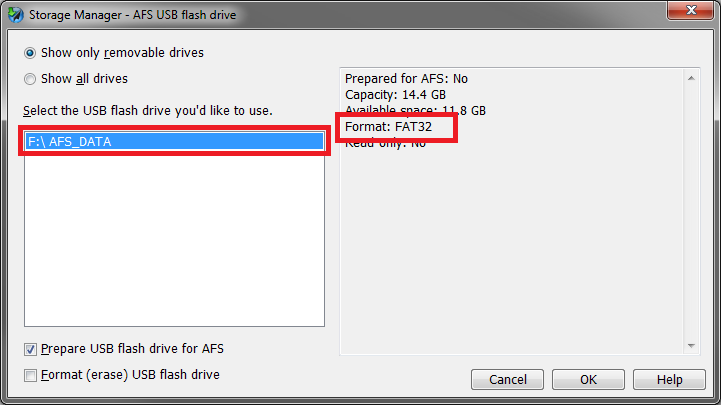 The memory stick must be labeled AFS_DATA. Mapping data for the US is available FREE from Advanced Flight every 28 days for AF-3000, AF-4000, and AF-5000 Series users with the mapping add-on key purchased with your EFIS (Verify this key on the ABOUT page). 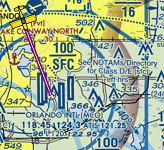 These updated contain the current airports, airspaces, and obstacles. The following United States and Territories data is released on the FAA standard 28 day AIRAC cycle. This is the most comprehensive data available for the US, including current airports, airspaces, and obstacles. The best part is it's free! Map Data can be loaded using the USB memory stick or SD Card. Right click and "Save Target As..." to download files. Be sure to extract all files from there zipped file when updating. Verify that the files are copied to the root directory (ie: X:\ ) of the storage device. Additional folders will not work. Mapping is a add-on feature and requires a key for activation. Verify this key on the ABOUT page of your screen. Map Version must be less then or equal to MV at the end of the system software version (i.e. MV15 works on a MV16 systems). 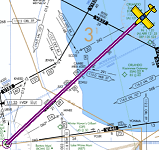 For US customers, chart data subscriptions, including sectionals, IFR low and high en-route charts, procedure charts, airport diagrams, and flight guide. Unlike other databases that are stored in display’s internal drive, charts and airport diagrams, because of their large size, must be stored on a USB memory stick that remains connected to the display during use. Through a Dynon subsidized program, we are excited to offer Seattle Avionics' geo-referenced Sectionals, IFR Low and High en-route, Approach / Departure Procedure Charts and Airport Diagrams (including thousands of Flight Guide diagrams) at unprecedented pricing of $99 per year. This includes both VFR and IFR data in one flat rate. Only one subscription is needed per airplane. Most charts and diagrams are geo-referenced, which allows us to display the aircraft's location superimposed on each chart. If you have an AF-5000 display running v12 software and want to use this optional data you will need to download the Seattle Avionics Data Manager and setup an account. You will need a dedicated and specially-prepared USB memory stick for each display in your aircraft. 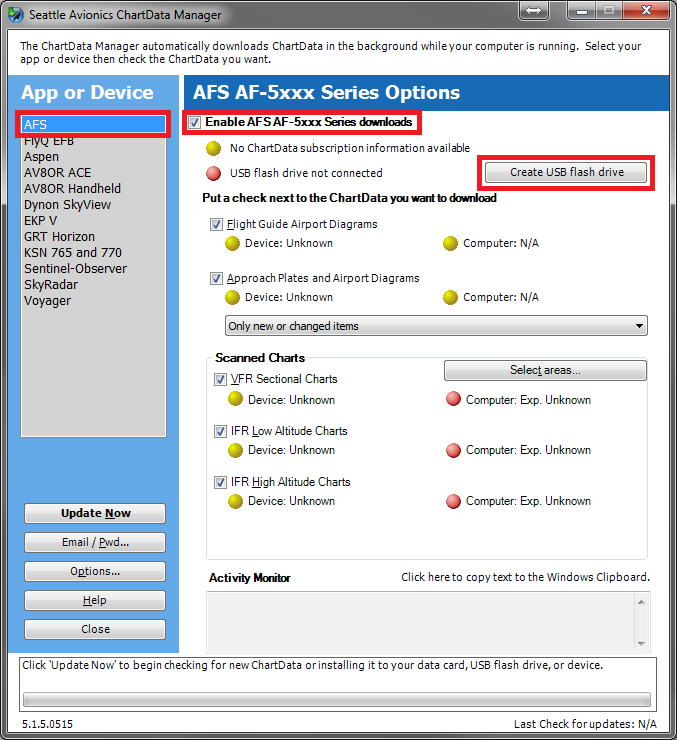 ChartData subscriptions, along with the download manager needed to obtain charts/airport diagrams and put them on your USB memory sticks are available directly from Seattle Avionics. 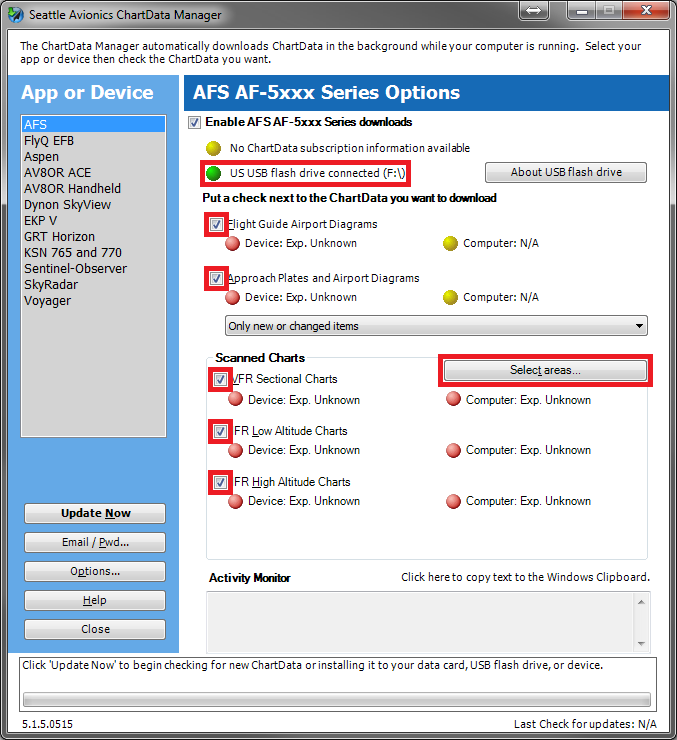 To purchase ChartData, go to http://www.seattleavionics.com/dynon and follow the instructions on the Seattle Avionics website to purchase and install Dynon SkyView ChartData on your USB memory stick(s) that have been prepared per the above procedure. If you encounter any technical problems during this process, please contact Seattle Avionics at (425) 806-0249 for technical support. 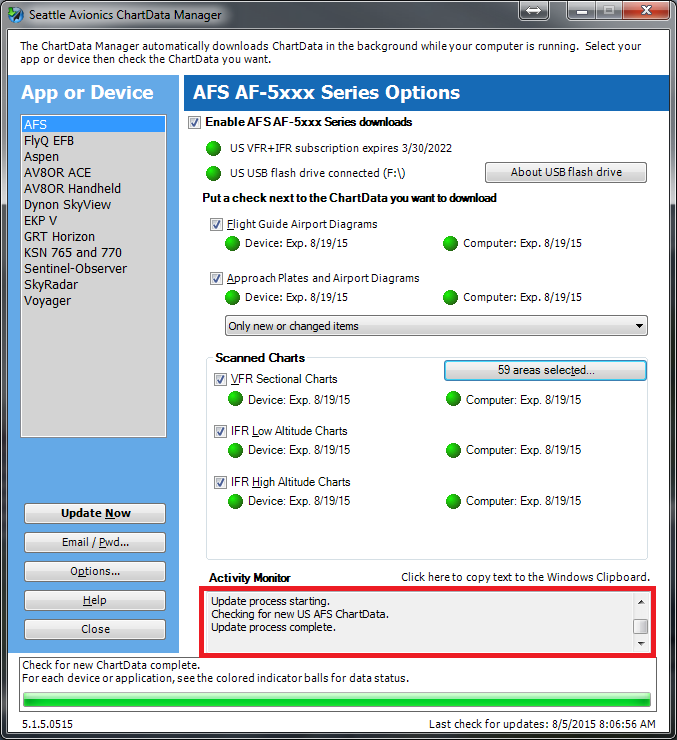 After you have installed ChartData to your USB memory sticks, simply connect them to your AF-5000 display(s) to enable charting capabilities. 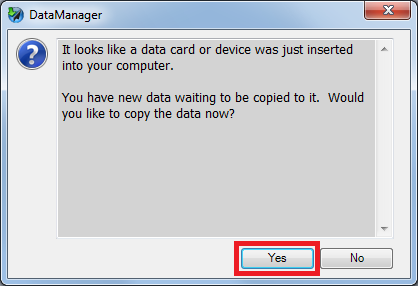 The USB memory stick(s) must be left connected to your display(s) during normal use for charts to be available. 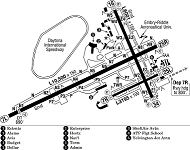 The chart subscriptions detailed on this page add chart and airport diagram data to AF-5000. To display this data on the AF-5000 map page, you must have an active GPS signal, a Mapping Software license (or unexpired 5 flight hour trial), and the appropriate aviation databases already installed. AF-5000 displays can be loaded with a 5 flight hour free trial of the Mapping Software. The Mapping Software Key must be purchased in order to continue to use it after the trial period ends. To check if your display has the MAP Key installed Press CHECK -> ABOUT -> SYSTEM and looks at the Keys:. Only one Mapping Software license purchase is required per airplane ($500). Licenses can be purchased from Advanced Flight Systems. If you have access to a PC running Windows	or	use Parallels / VMware to run Windows in a virtual machine on	your	Mac,	Seattle Avionics strongly recommend using the Windows-based DataManager	application rather	than	use this manual method. New netbooks or used laptops can be found for about $100. Seattle Avionics has a guide on how to create a USB memory stick using a Mac. Seattle Avionics ChartData Manager will require about 8 GB worth of data to be downloaded for a full download. Seattle Avionics recommends having 32 GB of free space available on your PC's hard drive. A full download will be about 8 GB and will take at least 17 hours on a 1 Mbps connection or 2 hours on a 10 Mbps connection. Then the data can be loaded to the USB flash drive which takes more time. Plan accordingly. NOTE: Changing App or Device from 'Dynon SkyView' to 'AFS' - To avoid complications please delete the ChartData and SkyView[US,EU] folders. At this point the software will take over and download data to your USB flash drive that was selected. Please wait for the Update Now button to reappear. ALL green lights next to your checked items indicates your device is READY. If not click Update Now again. 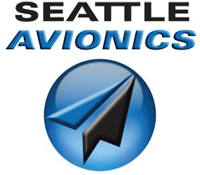 If you encounter any technical problems during this process, please contact Seattle Avionics via email at Support@SeattleAvionics.com or phone (425) 806-0249 for technical support. When new data is available from Seattle Avionics insert your USB flash drive into the computer running the Data Manager software. 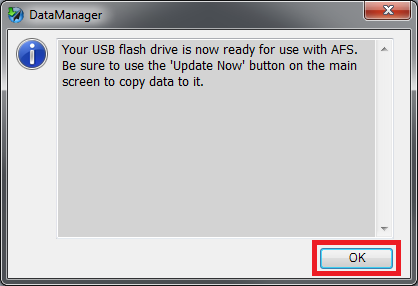 An alert will pop-up allowing the new data to be loaded onto the USB flash drive. ALL green lights next to your checked items indicates your device is READY. If not click Update Now again. Base map data files are not very large. They are approximately 10-20 MB each. 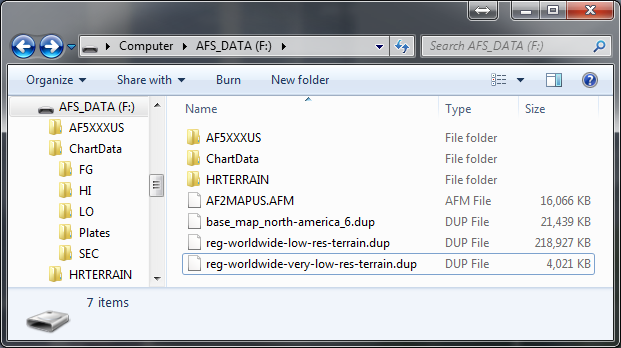 To import a base map file into your display, transfer the downloaded terrain file to a USB memory stick. Insert the memory stick into any of the USB ports on the display. Navigate to the Transfer Files menu, and select the base map file. Update History: 2013-06: Some roads, rivers, and railroads were inadvertently left out near the edges of base map database regions. There are three resolutions of terrain that all need to be installed to show terrain properly at all map range levels. Each AF-5000 display will need a USB memory stick loaded with High Resolution Terrain for your region. AF-5000 displays that have 10.00.00 or newer software shipped from AFS come pre-installed with worldwide low and very low resolution terrain. 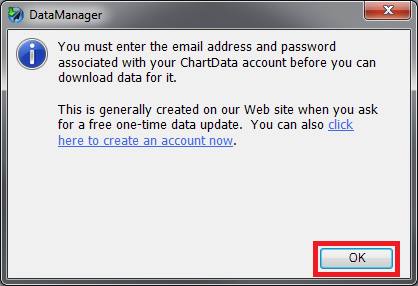 All other displays, including those that are being upgraded from earlier versions of software, should select and download the appropriate database from this page. To load the files onto an AF-5000, verify that you are operation on the latest software version then navigate to [SET] > [CAL] > Admin Settings > Transfer Files. Terrain files for the AF-5000 Series are broken into three chunks. Lower resolution terrain database of the entire world to augment the regional high resolution databases. This database is installed at the factory, but may need updating or re-installation. An example would be if you can not see terrain when zoomed out. Use the links below only if your screen has invalid data or have updated from a version of software older then V10.00.00. Each database must be loaded individually on each display in your aircraft. The worldwide terrain will allow you to zoom out and see every country. You will need to load both the low and very low terrain files to your AF-5000 Series. Click on a link below to start downloading terrain data for your region of the world. Mouse over a region link to view the section of the world the region covers. Terrain data files are about 2.5GB and will take a significant time to download. On a 10Mbit/s high speed connection, you can expect one file to download in about 1 hour. To import a terrain file into your display, extract the downloaded terrain file to a USB memory stick (at least a 8GB drive is recommended). Insert the memory stick into any of the USB ports on the display. A USB memory stick with database must be installed individually on each display in your aircraft.